TxDOT recently announced that the FM 1938 project is entering its final stages. On the street’s east side, the construction of the screen wall adjacent to Myers Meadow is underway with column construction and panel placement. Placement of the underground box culvert storm drains on the project’s north end are complete. Now crews are working on the roadway construction for the new northbound lanes from Brookforest Drive/Kingwood Drive to Randol Mill Avenue. Construction of the southbound lanes will follow once the northbound lanes are finished. TxDOT has estimated the project will be complete this summer. The 30 mph speed limit will stay in place until that time. Visit and like the Southlake Mobility Facebook page for the latest information on Southlake’s road construction projects. The massive $850 million, 27.8 mile, Midtown Express project is nearing completion and is anticipated to be finished by the end of 2018. Cheek Sparger Road is 99-percent complete. Drivers can expect to see the striping crew out on Monday, Jan. 9. Crews completed reinforcing the road’s base and structure and by replacing 8″ of asphalt.This roadway will serve the community for years to come. The project is a partnership between the City of Colleyville and Tarrant County. The County will provide the labor and equipment, while the City is funding the costs for construction materials and elements. This partnership is more fiscally responsible than if the City took on the project on its own. Crews began striping his past week with plans to finish striping this week, weather permitting. Traffic patterns have returned to the regular configuration. The re-construction of Cheek Sparger Rd was hampered by the cold weather and the rain, but the top course is now finished and ready for striping. The forecast for this week may affect work but city staff plans to have the roadway striped and barricades removed prior to school coming back from the holidays. Crews will continue placing asphalt along the corridor this week. This week, Tarrant County will begin the bottom course of asphalt paving on the north side, weather permitting. The new driveway approaches have been poured, along the south side with the exception of one, and it will be placed after the top layer of asphalt is placed. Drivers will see curb repair in areas on the north side as well, weather permitting. Crews working on Cheek-Sparger Road completed subgrade work and placed the bottom layer of asphalt from Bedford Court to Brown Trail. Crews began removing and replacing concrete driveways. This upcoming week traffic will move to the south side of the road. Although traffic is being moved, we ask drivers to be mindful to construction crews that are replacing concrete driveways. After traffic is switched to the south side, crews will begin removing the existing pavement on the north side and start prepping for the new stabilized subgrade. Subgrade work is complete and asphalt has been placed from Bedford Court to Brown Trail.Crews will be on location for three days this week and off on the Thanksgiving Holiday. Tarrant County will finish up miscellaneouswork and the concrete crew will be removing and replacing driveway approaches in this area. This week, weather permitting, crews will switch traffic from the north side to the south side midweek and begin milling the rest of the existing pavement and placing concrete. The traveling public is advised to seek alternate routes as delays will be expected. This work should be between the hours of 7:00 a.m to 6:00 p.m.
Subgrade preparation has been completed and crews will begin placing asphalt and miscellaneous concrete this week. The traveling public is advised to seek alternate routes as delays will be expected. This work should be between the hours of 7:00 a.m. to 6:00 p.m.
Construction has begun on Cheek-Sparger Road from Brown Trail to Bedford Road. Traffic is reduced to one lane in each direction and the center turn lane is closed. Milling operations have been completed and subgrade work will begin on Oct. 31. The traveling public is advised to seek alternate routes as delays will be expected. This work should be between the hours of 7:00 a.m. to 6:00 p.m.
Barricades will be placed along the construction corridor on Tuesday, Oct. 25. This section will be reduced to one lane of traffic in each direction. The center turn lane will be closed. Milling operations will begin on Wednesday, Oct. 26 and last through the end of the week. The traveling public is advised to seek alternate routes as delays will be expected. This work should be between the hours of 7:00 a.m. to 6:00 p.m.
Work to reconstruct Cheek-Sparger Road from Brown Trail to Bedford Road is projected to start the week of Oct. 24. The project will improve roadway conditions by reinforcing the road’s base and structure and by replacing 8″ of asphalt. Drivers should anticipate some delays as traffic will be reduced to one lane in each direction. Crews will be working on the right-of-way and the center turn lane will be inaccessible. City staff anticipates work to take 8-10 weeks. TxDot now confirms anticipated completion of the Davis (FM 1938) Boulevard project will be Summer 2017. TxDot recently confirmed substantial completion of the Davis (FM 1938) and Southlake (FM 1709) intersection by the end of the year. TxDot states that reconstruction is substantially complete with all through lanes on FM 1709 open, and that some work is still ongoing on the north side of the intersection and occasional lane closures will still be necessary. TxDot also says that sometime in January, weather permitting, that all other lanes at the intersection will be open when the taper to one lane north of the intersection is moved further to the north. TxDOT has informed the City that a traffic switch on Davis will occur on Friday, December 30th. Northbound traffic will be routed to the newly completed pavement. TxDOT uses social media accounts (created in September of this year) to aid with the communication of road closures and progress updates to Davis Boulevard. You can “like” the FM1938Mobility page on Facebook or “follow” FM1938Mobility on Twitter for the latest updates. The City of Southlake will continue to keep you updated through the City of Southlake, TX – Government Facebook page and City of Southlake Twitter page. You can also find information at the Southlake DPS Facebook page and the Southlake DPS Twitter page. Also, information will be updated on the City’s FM 1938 Road Construction page. If you have questions specific to the construction, please contact Stephen Ranft from TxDOT at 817-462-0520 or Alex Ayala from the City of Southlake at 817-748-8274. As Southlake Water Utilities nears completion of the “Wired for Water” project implemented this summer, staff is available to provide detailed benefits of the upgrade, including tips for lowering your water bill. Starting May of this year, the Utility partnered with Badger Meter to upgrade water meters in Southlake with cellular endpoints. Badger Meter offers through their advanced water meter systems the opportunity for you to monitor your water usage 24/7 through “EyeOnWater”. This is an online portal that provides real time access to your water consumption. Residents have begun to receive notification through the mail about features of the enhanced system and step by step instructions on how to register in the “EyeOnWater” portal. To date, there are less than 250 meters pending receipt of the upgrade. Through Badger Meter’s “EyeOnWater” software, you are able to monitor your water usage by the hour. “EyeOnWater” provides you with the tools to be in control of your water consumption. The smart system places control in your hands! What do you mean by “in your hands”? With the touch of your fingertips, or a click of your mouse, you can access your meter information through “EyeOnWater.” A link for “EyeOnWater” is available on the Southlake Water Utilities website or on your smartphone. The “EyeOnWater” app is available at Google Play and iTunes stores. Want to Understand Your Water Bill? That is a great starting point. Our website has a sample bill with highlighted sections to guide you through the document. The bill displays your consumption over the past 18 months, as well as your current usage. An example bill is provided online on Southlake Water Utilities webpage. Southlake Mayor Laura Hill recently posted on her personal Facebook account her water bill. Her goal was to reduce her water consumption this August and September from what it was last year. She took advantage of the ability to view her water usage over the past 18 months on her bill. Utilizing water conservation resources provided by the Water Smart, Southlake blog, she was able to reduce her consumption for this August and September. Water Smart, Southlake is a blog that offers residents of Southlake the best ways to be smart with your water. Subscribe to our blog to get the best practices in water efficiency. If you have questions regarding your water bill, contact the Southlake Water Utilities Customer Service at (817) 748-8051, or stop by Suite 200 on the 2nd floor of the Southlake Town Hall to talk to someone in person. Walking, running, and cycling through Northeast Tarrant County just got easier with completion of the final segment of the Cotton Belt Trail between Colleyville and Grapevine. Measuring 800 feet, the final segment completes 11 miles of trail connecting Colleyville, Grapevine, Hurst, and North Richland Hills. On Friday, April 15, city leaders, trail partners, and the public gathered to commemorate the opening of the trail, along with a new pocket park the city of Colleyville created as an amenity for those using the trail. The new park is located at the intersection of SH 26/Colleyville Boulevard and John McCain Road. It offers a more shaded, scenic route, a rest area with bench seating, and a multi-function drinking fountain, which means dogs get to drink, too. Construction on a new park in southern Haltom City is nearing completion (projected mid August). 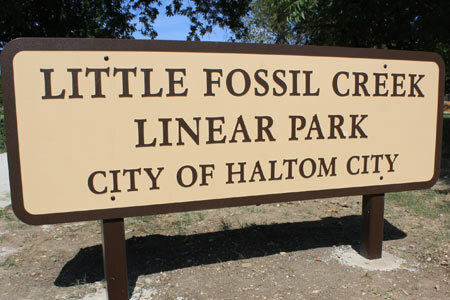 Little Fossil Linear Park, which includes a hike and bike trail, picnic pavilion, playground and restroom, is located just off of Thomas Rd. on Orval Court. The park won’t officially open until street repairs on Orval Court are complete. 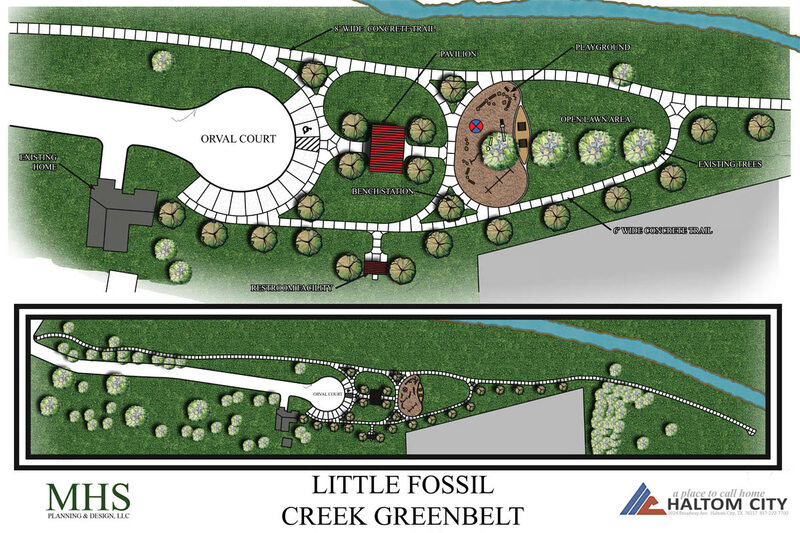 Funding for the first phase of the linear park was provided by a $500,000 grant from Texas Parks & Wildlife and $70,000 in funds from the Haltom City 2010 park bond election. An overhead rendering of the new park can be seen below. Earlier this year, we informed Southlake residents of plans to install Pressure Regulating Valves (PRVs) at various locations around the City as part of the Southlake 2030 Water Master Plan. A third party consultant was hired and conducted a water model computer analysis for the City’s water infrastructure network and identified five areas within the high pressure plane which have marginal capabilities during fire flow situations. Beginning in February of this year, work to install the PRVs at these locations (see map for locations) officially began. The Pressure Regulating Valves are a Tier 1 project aimed at improving City water flow during firefighting emergencies.The PRVs are designed to detect the changes in pressure between the high pressure and low pressure planes and electronically adjust the water flow to supplement the availability of water during a critical need situation. “The low pressure plane has historically been a concern for the Fire Department if we were to have a significant fire on the East end of town,” according to Deputy Fire Chief Wade Carroll. “The addition of the new pressure regulating valves will ensure that there is sufficient pressure to fight a large fire in an area of town that has historically been a concern,” he adds. Over the next several months, five (5), 6 foot by 9 foot vaults were installed at the identified locations and connections were made to existing 12” and 20” water lines that sit on the border of the high and low pressure planes. Beginning this week, we saw the final piece of this project going up – the above ground antennas. The antennas are a critical last component to this project and serve an important role in ensuring consistent water flow during fire emergencies. During a fire, for example, an electronic signal can be sent to water personnel letting them know whether the valve is open or closed. Water personnel can then make adjustments to the pumps remotely via the City’s SCADA system should additional water pressure be required in order to aid the fire department as needed. “Effective fire flow is greatly influenced by the water pressure within Southlake’s water system,” notes Deputy Chief Carroll, and the antennas will ensure that pressure is constant during such emergencies. For additional information about the Pressure Regulating Valves, visit the project page here. For questions about the project, please contact Alex Ayala, P.E. at 817-748-8274.